Here come the bride! In an appropriate Derby hat, of course…and accompanied by bridesmaids in blue dresses that compliment the red rose bouquets. And now for the groom. Don’t you just adore these bright boutonnieres? The black and white stripe ribbon ties in with the invitations. These place cards are one of my favorite parts of this inspired wedding. I love the different color jockey silks guiding each guest to their own table! In keeping with the equestrian theme, the red rose centerpieces are accented with a horse shoe. Of course, now that I’ve said that about the place cards, we get around to the dessert bar…another of my favorite parts! Red velvet cake, Derby pie, horseshoe cookies, and a stunning little red rosette cake…perfection. 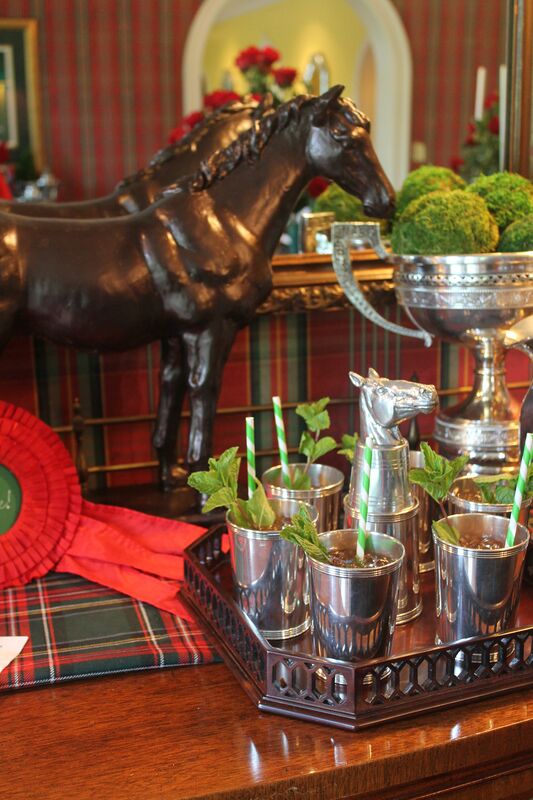 Oh, and we can’t forget the mint julep bar…. So belles and beaus, what do you think? 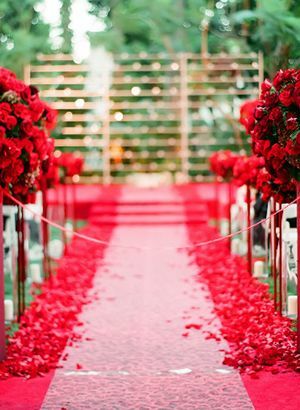 Would you do a Derby themed wedding? Are you digging this vibrant red paired with accents of blue and subtle stripes? I personally love how bold it is! Budget-Friendly Tip: Wear an “Already-Loved” Wedding Dress!